How to Repair a Ceiling Light Leak. 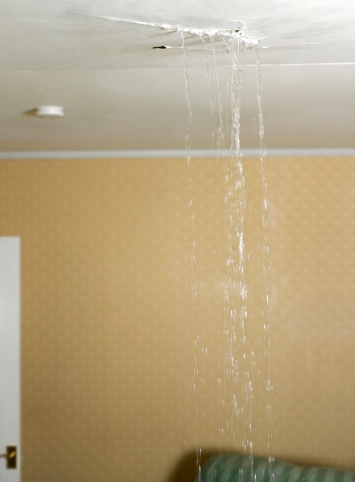 If you notice water leaking from a light in your ceiling, you have a roof or condensation leak. Take care of the problems as soon as you notice it to minimize the amount of damage and the costs of repairs. You don't have to be a professional contractor to repair the leak. Here's how to repair a ceiling light leak. Determine where the water is coming from. Check out the attic area directly over the leak to determine what's happening. Air conditioning units placed in the attics are a common source of leaks, as are roofs. Repair the leak first before fixing your ceiling. If you cannot fix the roof or condensation problem, call a professional. Don't repair your ceiling without first eliminating the source of the leak or it will leak again. Turn the light off and remove the bulb. Have a pan or bucket underneath the fixture to catch dripping water. Feel the ceiling area directly around the light fixture. If your ceiling is drywall and you caught the leak quickly enough, it may dry out and be fine. Allow the area to completely dry. A fan can speed up the drying process. Patch the drywall around the light fixture if it feels mushy to the touch after drying. If it feels OK, seal it with a quality primer and then touch up paint as needed. Install a new bulb in to the light fixture once completely dry. If the fixture no longer works due to the water, call an electrician for repairs.